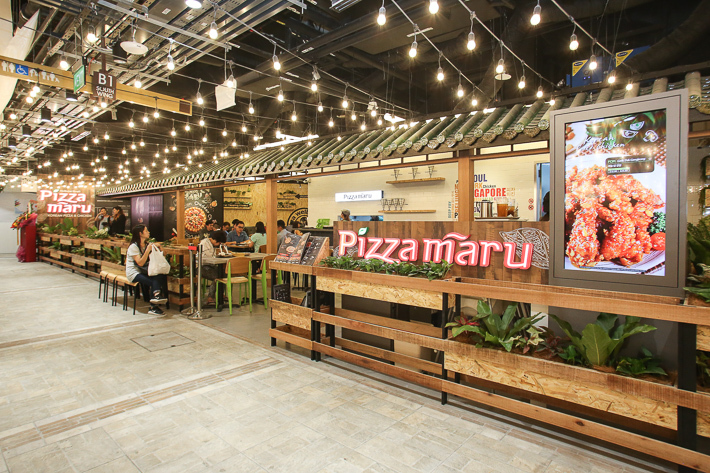 Pizza fanatics rejoice, for the world’s largest Korean pizza chain, Pizza Maru, is now in Singapore! Famous for their plethora of fusion-style pizzas, pasta, bibimbap towers and wildly-popular Korean fried chicken, the world’s largest Korean pizza chain has finally reached the shores of our sunny island. With more than 650 stores across Korea, United States of America, China, and Hong Kong, the Korean pizzeria’s first outlet in Singapore is an 80-seater joint. The first of its kind in Singapore, Pizza Maru is dedicated to advocating a healthy-wellbeing concept through its signature premium Korean pizzas. What makes their pizza perfect for the health conscious is their ‘wellbeing’ dough. This special, nutrient-packed dough formula boasts a soft, bread-like texture comprising green tea and chlorella, along with 12 healthier grains which include rye, black rice, barley and oats. Who’s up for guilt-free pizzas? Available in 7 yummy options, Pizza Maru’s series of Premium Pizzas are made with patented green tea wellbeing pizza dough. Fermented for over 48 hours with chlorella alongside a variety of natural grains such as flaxseed and barley, this series serves as more of a nutritious and well-balanced treat that not only satiates but also satisfies your pizza cravings. Feeling adventurous? Dive right into the Mango Ocean (regular S$19.80, large S$23.80) and sink your teeth into the generous chunks of nectarous Mangoes accompanied with shrimps and scallops on the freshly baked crispy bread base. The sweet mangoes and savoury seafood combination are perfectly matched with spicy buldak sauce, a generous spread of Mozzarella Cheese and Pilaf sauce. 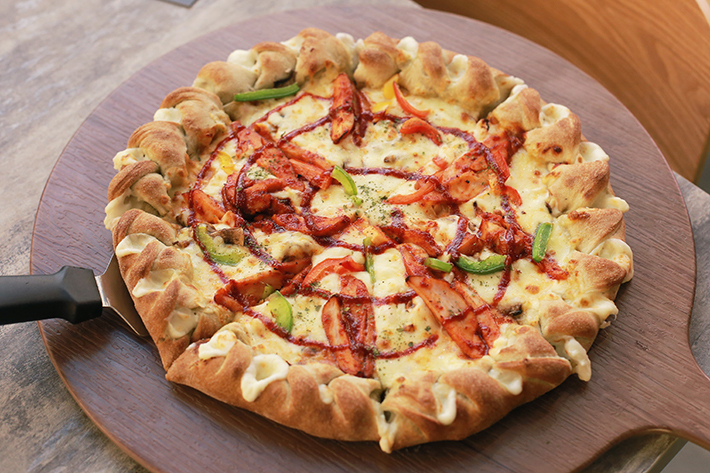 Other delectable pizzas from the Premium Pizza range include the Korean Surf’n’Turf (regular 9” S$19.80 and large 12” S$23.80)—a harmonious blend of flavours boasting tender Korean-style beef and shrimps atop a bed of greens lined with zesty sweet ranch sauce and topped with sour cream and Mozzarella Cheese. Adding on to Pizza Maru Singapore’s slew of pizza offerings is the Chicago Pizza series, which are all prepared using fibre-rich and antioxidant-packed black rice dough as its base and are available in 6 different flavours. The Real BBQ Chicago (S$26.80) comes studded with almond flakes and icing sugar sprinkles. The chewy and fluffy crust of the pizza boasts delectable chicken leg bits, potato cubes, roasted onions, tomato and mushrooms. Besides your regular toppings, there are lots of cheese added and many different kinds of cheese at that. Think creamy double mozzarella cheese, string cheese and a cream cheese mousse blended with a combination of honey and BBQ sauce. With so much cheese packed into one pie, it is indeed possible to pull off a pretty insane cheese pull—we tried it for ourselves and managed to stretch it over 1 metre! Aside from the carefully crafted premium pizza flavours, diners at Pizza Maru Singapore can also enjoy the exclusive green tea wellbeing dough with fuss-free Classic Pizzas featuring both all-time Western and Korean favourites such as pepperoni pizza, bulgogi pizza and many other choices. For a bespoke treat, add on an extra finishing touch with one of the 3 special crusts to either a Premium or Classic Pizza order—Golden Edge, that features a combination of sweet potato mousse and 2 types of cheese, Bite, for easy bite-size bulges filled with a sweet potato mousse and string cheese around the crust and Double Cheese Twist for the serious cheese lovers. 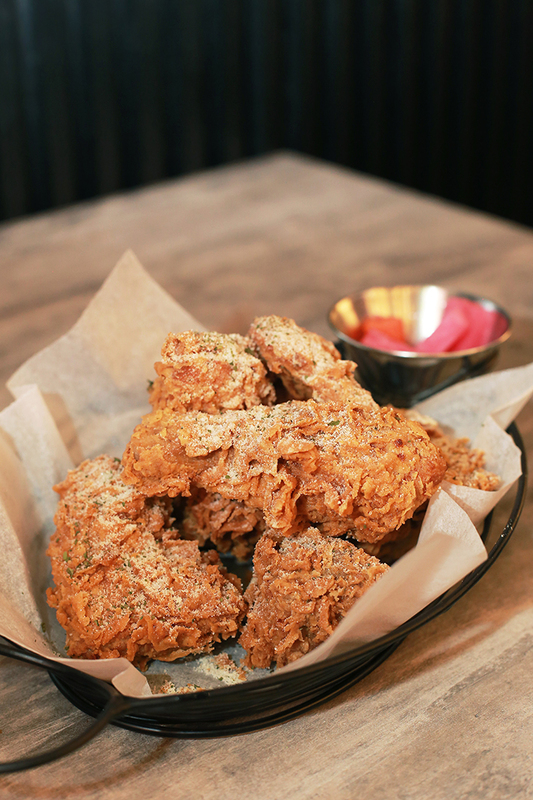 Keeping to its Korean origins, Pizza Maru Singapore also offers the famed Korean Fried Chicken. To savour the crispy and juicy delicacy in its most natural form, opt for the Original Fry, if not, allow the 5 tantalising variations to excite your taste buds further. For that perfect balance of sweet and savoury, go for the Honey Butter Coat (S$16.80 for 6 pieces, S$29.80 for 12 pieces) that features a generous dusting of sweet, buttery powder. The sweetness really takes the edge off the savoury chicken wing and if you’re dining with kids, this is guaranteed to be a hit among the little ones. Lovers of all things spicy should definitely go for the Supa Hot Dak Gangjeong (S$16.80 for 6 pieces, S$29.80 for 12 pieces) variation that features 2 levels of spice but do be warned, level 2 is not for the faint of heart—we are no strangers to heat but boy did this light up our sinuses. Spice aside, the sweet chilli sauce was really tasty on its own and the pickled vegetables served on the side really do well to combat the fiery kick that the sauce delivers. Last but most certainly not the least is the Onion Tartar (S$16.80 for 6 pieces, S$29.80 for 12 pieces) that sees a generous slathering of tangy tartar sauce along with thin slices of piquant onion atop crispy fried chicken. Not only did the tangy tartar sauce cut through the deep-fried batter, it masked the “pungent” flavour of the onion slices which made the dish less cloying and even more enjoyable with every bite. Aside from the pizzas and Korean fried chicken, diners can also expect other interesting dishes at Pizza Maru Singapore such as the Instagram-worthy Bibimbap Towers. This modern rendition of the classic bibimbap takes the shape of a mini “tower”. We got ourselves the Spam Tower (S$12.80). It comes with chicken spam and fried kimchi sandwiched between a sunshine egg and rice, drizzled with sriracha sauce and topped with golden potato crisp and parmesan cheese. This post was brought to you by Pizza Maru Singapore.